The contact stress is shown over the length of the rollers. 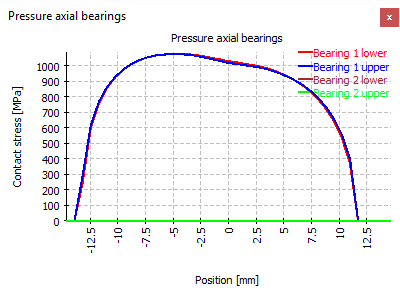 In the user interface, there is one graphic for all bearings of one type, in the report, one diagram is shown for each bearing. The position in the diagram is either the axial or radial coordinate with the origin at the center of the roller. For radial bearings, the orientation is like the orientation of the y-axis. The position is running from bottom to the top of the bearing. For axial bearings, the orientation is the radius; the position is running from inside to outside.